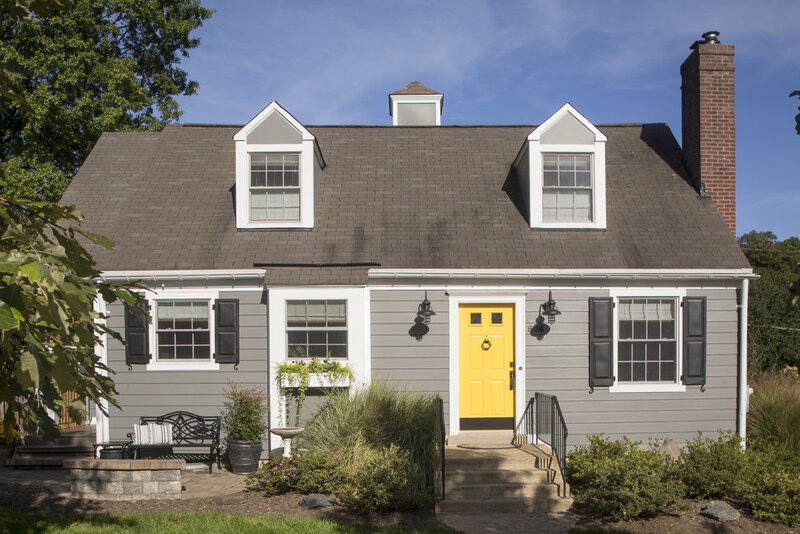 On the exterior - the siding became dark grey (BM Amherst Grey) with off-white trim (BM Distant Grey) and bright, happy doors (BM Viking Yellow). Gooseneck sconces from Barn Light Electric replaced too-small carriage lights. Black shutters and a window box complete the look. Can you tell a Steelers fan lives here?! We removed gingerbread molding and cleaned up the exterior of this sweet Cape Cod style home. All photos by Helen Norman. This adorable home in Falls Church was built in 1939. At some point in the last 30 years, it was gutted by a former owner/builder for his daughter to live in. I don't believe she ever moved in, but around 8 years ago my clients did. The house was basic, but functional (90's kitchen and bathroom remodels). They planned a gut renovation for several years, and we discussed it while working on other areas of their home together - first the upstairs, then later the basement, which was their first major project in the home. The new bright and open kitchen - classic white shaker cabinetry, hand glazed tile and a black and white granite with lots of flowing movement. A kitchen TV was a must have for the football loving couple. The husband does the majority of the cooking,, and can now watch games and chat with guests at the bar and in the sitting room as he prepares food. My clients wanted a light, bright space where they could cook and entertain friends and family. I encouraged them to retain the feeling of the original home, selecting finishes that work in a Cape Cod but also allowing themselves to inject their own personality. We discussed what they wanted, then they worked with Sun Design's team to select their finishes, and would review with me afterward and make any changes we decided on. This was a great way to work for them as Sun Design have a wonderful design team who were very flexible and accommodating, and didn't mind me butting in with my two cents (or at least were very gracious in not saying so to me!!!) We selected a light grey crackle glaze handmade tile with some glaze variation for the backsplash in a long subway format, paired with this stunning granite with lots of movement. Inset white cabinets in a simple shaker style complete the classic feeling. The clients were so happy to go from their builder-grade white melamine cabinets with off-white laminate counters to this! The new layout - much more open and communal. In the sitting room, just off the kitchen, we went for a conversation seating arrangement. The clients entertain often, and wanted to be able to have guests sit by the fire with wine. We selected swivel chairs, so guests can swivel toward the kitchen or fireplace, or even the living room which is open to this room (with original pocket doors) to the left of the fireplace. I like to encourage my clients to take a few risks in our designs. As designers, it is easy to forget that our clients aren't exposed to interesting design in the sheer volume that we are, so there are pieces that might be a little shocking to them that are not at all to us. There is almost always a piece (or two) in my designs that my 'idea' for the feeling of that space centers around, and really makes the design. In this room, it was the ceiling fixture, paired with the coffee table. I imagined them this way from the beginning of the project, and knew it would take some coaxing for my clients to be comfortable with them, but was willing to fight their corner to be included because they were such a strong part of the overall vision. To my surprise, they signed off on the coffee table straight away... but the light fixture was not so easy! After a couple of months of deliberation and discussion (and even a holiday party where the potential light was the subject of much discussion!) the clients decided to put their trust in me and signed off on the fixture. Unfortunately by this time, the fixture I had selected had become back-ordered for a very long wait. Luckily I was able to source this very similar one, and it really completes the room. The clients say it is one of the first things visitors admire in the space, and they love it. I am always happy to try to work in family heirlooms and sentimental pieces. In this room, the clients Grandmother's clock takes center stage on the mantle, while her writing desk sits out of frame to the left. The swivel chairs allow for fireside chats and open up the space to the surrounding rooms. The sitting room leads onto the living room, where my clients like to cosy up and watch TV. We went a little more relaxed in here - it's a space for lounging, movies and playing board games with their nephews and nieces. This used to be a den/bedroom, and the bathroom entrance was on the left. Sun Design were able to move the bathroom entrance to the hallway and create a closet here for storage and to house all the entertainment equipment. This makes a small room (around 12x12) feel much more spacious, and allowed me to squeeze in another seat. The living room - a comfy spot for a night of Game of Thrones watching! The clients love to collect artwork, and have a great eye for interesting pieces. The wife's father gifted her this fantastic vintage 70's poster from the Lincoln Center, which used to hang in the dining room. We moved him to a great spot opposite the front door, so that Raúl Juliá (as Mack The Knife) can greet guests as they enter. Vintage poster from the 1976 revival of The Threepenny Opera at the Lincoln Center in DC. Who wouldn't love to be greeted by Gomez?! The living room and dining room both open onto a long deck, which makes entertaining in the warmer seasons easy - they can just throw open both doors and guests can mill about. The dining room - the 72" round table can seat eight comfortably, even in a tight space. In the dining room, it was important for my clients to be able to seat many people. They love to have friends and family over to eat, and often host nephews and nieces. They are fantastic hosts and love their guests to be comfortable, so we selected furnishings that were sturdy, comfortable and easy to clean. The 'rug' here is a series of FLOR tiles. In case of a spill, each individual tile can be picked up and washed off. I always like to leave space in my designs for collectors to continue their finds and add to their rooms, and give them some parameters of what to look for (size, colour, style). On the right (not pictured) above the buffet, we used a large piece of art they already owned, and on the wall above shown, we left a space for new pieces. In the hallway, Sun Design were able to carve out space for this gorgeous shower room and a closet out of the original bathroom space. We retained the functionality of having a ground floor full bathroom (wonderful for aging in place). I also had them add blocking in the shower for handrails, should they ever be needed in future. Since the living room can still function as a bedroom, this gives great options for the configuration of a home if you plan to stay in your home as you get older, or have aging family members. In the case of these clients, having a ground floor full bathroom was still a wonderful perk after a surgery shortly after the remodel that required no stair climbing for a couple of weeks. The bathroom - echoing the feeling of the original black and white bathroom with the new gray and black marble paired with white subway tile and a black pinstripe liner. The mudroom is my clients daily entry and exit from the house, just off the kitchen. We wanted them to be just as happy coming through the 'side door' as they would in the main entrance, so we used the same Viking Yellow for the door and the same hardware. We updated the orange pine paneling with a coat of BM's Plymouth Rock, and slate-look porcelain floor tile. Finally we added functionality with a seat cushion and some hooks. Yellow doors bring smiles even on a gloomy day! Because of the scale of the home and each room's openness to the next, it was important that each space work with it's surroundings, even as some were more formal and others more relaxed. Having a wonderful and capable contractor in Sun Design to project manage their remodel meant we were able to focus on the aesthetics, and my clients are thrilled with the results. If you're planning a remodel, interview your contractor thoroughly. Ask for previous references, and visit completed projects (or even in progress remodels, if possible!) And of course, if you want to enjoy your freshly remodeled spaces to their fullest, enlist the help of an interior designer from the start. It is so much easier (and less expensive!) to involve your designer at the beginning of the remodeling process. If you're in the Metro DC area and thinking about remodeling, or want help with a space, get in touch!